If you are looking for the Ultimate way to spend a day on the sea in Puerto Vallarta, this Private Sailing and Snorkeling Charter may be just what you are looking for. Puerto Vallarta is renowned for the incredible Sailing conditions and there is no better way to spend the day then onboard a beautiful sailboat with your friends and family. 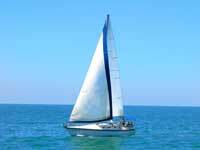 Our private sailing adventure will be onboard a 40 ft sailboat that accommodates up to 12 passengers comfortably. 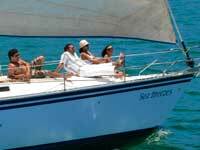 This is a beautiful boat that is spacious and is ideal for cruising and relaxing in the smooth waters of Banderas Bay. This fully equipped sailboat has a bimini top providing a shady area over the cushioned cockpit area. Come join us for a day of relaxing sailing and snorkeling the pristine pacific waters of beautiful Banderas Bay and enjoy the abundance of wildlife and sea life in its natural habitat. Banderas Bay is right in the center of an incredibly deep, ancient volcano. Having your personal choice of itineraries from our Signature tours or Custom tours, the options are endless and sure to please. If you've dreamt of learning to sail, our Captain is always happy to show you the ropes. Our Signature 4 Hour Tour tour sails through Banderas Bay offering amazing views of the picturesque coastline and beautiful Sierra Madre Mountains on our way to Los Arcos Marine Reserve, one of our favorite stops for a fabulous snorkeling. 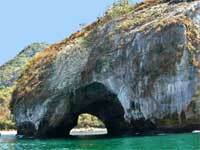 Los Arcos is a cluster of massive rock formations carved out by the ocean over thousands of years. These huge rocks have formed stunning arches that you can snorkel through. 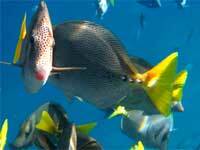 Here you'll see hundreds of tropical fish and turtles, octopus and perhaps even a manta ray. The 6 hour Signature Charter includes the snorkeling trip to Los Arcos Marine Reserve plus a stop at the secluded beaches of Las Animas or Quimixto. 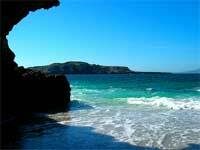 Both beaches are located on a beautiful coves and accessible only by boat. 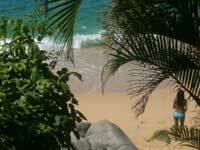 Enjoy a romantic lunch under a palapa, swim in the shallow water or collect sea shells. The choice is yours. Our Signature 8 hour Sailing Private Charters takes you to Las Marietas, a small group of uninhabited Islands, that have been declared a National wildlife and sealife reserve. Another option for the 8 Hour Charter is to Yelapa a secluded fishing village on a picturesque bay offering incredible snorkeling and swimming as well as inland waterfalls. 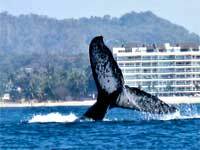 During the months of November to April Puerto Vallarta has the added attraction of Whale Watching. Pods of graceful Humpback Whales can be spotted all around the Bay of Banderas. Make sure to have you camera close at hand to take photo of these incredible Humpbacks and their beautiful babies. We guarantee a full refund of your excursion deposit if your ship can not make it into the port of Puerto Vallarta, Mexico.